We currently have around 50 members from a wide range of singing backgrounds. Many live locally and others travel from across Birmingham, the Black Country and Worcestershire to sing with the choir. Nicola is a versatile musician with a huge passion for choral music. An experienced and inspiring choral conductor, she loves working with amateur and professional singers of all ages and is known for her encouraging approach, attention to detail and imaginative programming. Nicola studied Music at Downing College, Cambridge where she was an Organ Scholar and was responsible for conducting the Chapel Choir and leading choir tours abroad. She then trained as a secondary music teacher at Birmingham City University and worked in schools in the West Midlands before taking time out of teaching in order to be at home with her children during their pre-school years. During this time Nicola founded Quinton Community Choir, a non-auditioned choir now made up of over 90 members aged 8-88 and which gives performances at numerous community events and at concert venues in central Birmingham, often collaborating with other ensembles. Nicola returned to university as a mature student gaining a Masters in Choral Conducting at Birmingham Conservatoire where she was the recipient of the Sir Michael Beech Conducting Award and the MMus Course Prize. Her principal studies in conducting were with Paul Spicer and she received vocal coaching from Maureen Brathwaite. During her time at the Conservatoire Nicola conducted Camerata, a student chamber choir, and founded Polaris, an upper voices ensemble which specialises in music from Eastern Europe, the Baltics and Scandinavia. She also sang with Birmingham Conservatoire Chamber Choir for whom she was the alto soloist in a recording of Vaughan Williams' Mass in G minor. 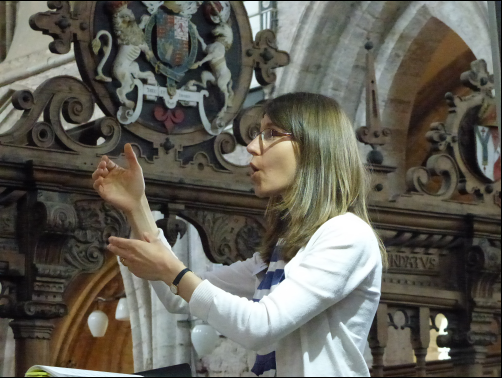 Nicola now pursues a varied freelance career as a choral conductor, choral singer and teacher. In addition to her work with Quinborne Choir, Quinton Community Choir and Polaris Vocal Ensemble, she sings with Birmingham's acclaimed choir Ex Cathedra and is Musical Director of Ludlow Choral Society and the 150-strong boys' choir at King Edward's School, Birmingham. Outside of music, Nicola enjoys escaping to the countryside for long walks and bike rides with her family! She lives in Quinton with her husband and three children where they are part of St. Boniface Church. Darren Hogg was born and educated in Birmingham. He trained at Birmingham Conservatoire from 1989 to 1993 studying organ, harpsichord and piano accompaniment with David Ponsford and David Saint. Darren is currently Organist at St Leonard's Church, Frankley, having previously held posts at Halesowen Parish Church (St John the Baptist), St Augustine's Church, Edgbaston and St Alban's Church, Conybere Street, Birmingham. He is one of two Organists at Lodge Hill Crematorium, Selly Oak, Birmingham and deputises at Birmingham Cathedral, the Blue Coat School and St Mary's Collegiate Church, Warwick. He is Accompanist / Assistant Director of Music for Birmingham Choral Union, Solihull Chandos Choir and the Quinborne Choir and often works with the City of Birmingham Choir, The CBSO chorus, Birmingham Festival Choral Society, the Armonico Consort, Notorius Choir and Sing Live UK. He was Accompanist / Assistant Director of Music for the Midland Music Makers Grand Opera Society (now Midland Opera) from 1992-2002. 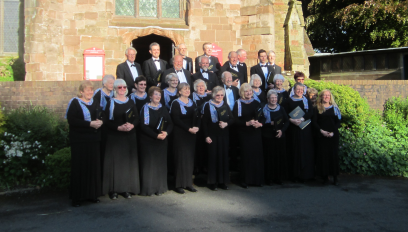 He has performed with many other societies in the Midlands, including the Birmingham Bach Choir, the Canoldir Male Voice Choir and the Heart of England Singers. He has featured as Organist on BBC One Songs of Praise, Radio Two Sunday Half Hour, and Radio Four Daily Service. Darren has won various competitions, including the 1991 Birmingham and Midland Institute (B.M.I.) Organ Performance Prize, and the 1992 Gordon Clinton English Song Competition Piano Accompanist Prize. Darren regularly gives recitals. Past venues have included, Lichfield Cathedral, Birmingham Cathedral, Tewkesbury Abbey, Leominster Priory, St Martin's in the Bullring (Birmingham Parish Church), St Alphege Solihull (Solihull Parish Church), St Alban's Church Conybere Street, St Augustine's Church Edgbaston, Halesowen Parish Church and Bournville Friends Meeting House. From 1994-2001 Darren was a tutor of Organ and Piano at the Birmingham Conservatoire Junior School. He now runs his own private teaching practice (Organ, Music Theory and Piano). 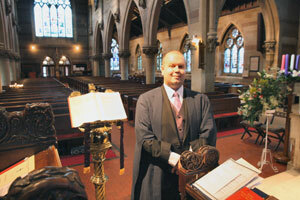 He is a member of the Birmingham Organists' Association and has also served on the Association council. In 1992, the Association awarded Darren the Leonard Gibbons Memorial Prize for Young Organists. Darren is a full member of the Musician's Union (M.U.) and is married to Barbara, a Mezzo-Soprano and primary school teacher. They have a daughter, Abigail, who was born in November 2004. Outside the world of music, Darren and Barbara are members of the Campaign for Real Ale (C.A.M.R.A. ).